By Bus: Take bus number 68, 66, 14, 35 from the Jerusalem central bus station or bus number 7, 9 from the city center, get off the bus at The Hebrew University, Edmond J. Safra Campus, Givat Ram, and walk to the Levin (or other relevant bldg, as on the map below). By Car: When using the the standard entrance (coming to the main Jerusalem entrance) use the Jerusalem municipality map linked below or the one found here. 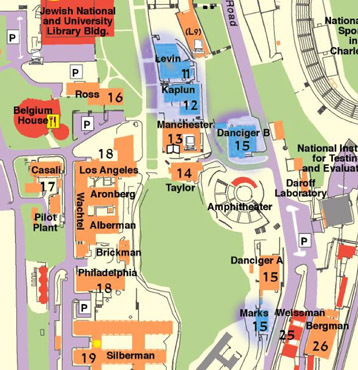 Within the campus, park either below (to the east of) the Levin/Kaplun/Dancinger-B/Marks bldgs, or above Beit Belgia. Don't forget to ask in advance for an entrance permit from your host within the university. Edmond J. Safra (Giv'at Ram) campus map. Various university maps (including other campuses and parking lots). Jerusalem Navigatable Map (Also in Hebrew).